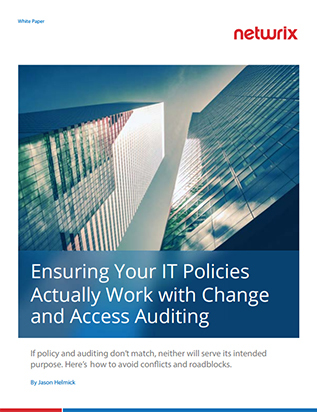 Your organization might be reviewing the occasional server log, perhaps even auditing for user account changes to Active Directory, but are you helping your company to create and implement a formal and rigorous auditing policy? This involves more than selecting what to audit; it means understanding and following a process of defining, monitoring, detecting and responding to your business’s change and access auditing needs. If policy and auditing don’t match, neither will serve its intended purpose. In this whitepaper you will learn how to avoid conflicts and roadblocks.